Super fruity fragrance. No tears! No knots!. 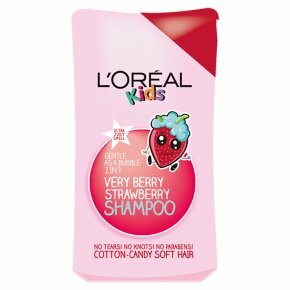 L'Oreal Kids we're worth it too!.Knots can't fight against the conditioning 2in1 formula of L'Oreal Kids. Its creamy formula leaves hair feeling so soft and looking so shiny. L'Oreal Kids is so gentle, it's tear free! Who? Sally Strawberry What? Makes your hair feel super duper soft almost like cotton candy! How? Wet hair, squeeze a burst into your palm. Apply shampoo, lather up rinse and clean and *tadaa* Discover clean and extra soft feeling hair.